Extracellular domain of unknown function in nidogen (entactin) and hypothetical proteins. The ~180-residue NIDO domain is an extracellular domain of unknown function, found in nidogen (entactin) and hypothetical proteins. The NIDO domain is found in association with other domains, such as nidogen G2 beta-barrel (IPR006605), thyroglobulin type-1 (IPR000716), LDLRB (IPR000033), AMOP (IPR005533), EGF-like (IPR000742), VWFD, IPT/TIG, or sushi/CCP/SCR (IPR000436) [(PUBMED:11893501), (PUBMED:12084055), (PUBMED:15053982), (PUBMED:16500040)]. 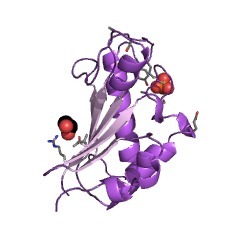 Vertebrate nidogen-1 (NID-1) or entactin, a sulphated glycoprotein widely distributed in basement membranes. Vertebrate nidogen-2 (NID-2) or osteonidogen, a cell adhesion glycoprotein which is widely distributed in basement membranes. Mammalian mucin-4 (MUC4), a highly glycosylated membrane-bound protein. Xenopus ID14, a putative matrix protein. There are 3427 NIDO domains in 3003 proteins in SMART's nrdb database. Taxonomic distribution of proteins containing NIDO domain. This tree includes only several representative species. The complete taxonomic breakdown of all proteins with NIDO domain is also avaliable. Click on the protein counts, or double click on taxonomic names to display all proteins containing NIDO domain in the selected taxonomic class. Positioning of longitudinal nerves in C. elegans by nidogen. Basement membranes can help determine pathways of migrating axons. Although members of the nidogen (entactin) protein family are structural components of basement membranes, we find that nidogen is not required for basement membrane assembly in the nematode Caenorhabditis elegans. Nidogen is localized to body wall basement membranes and is required to direct longitudinal nerves dorsoventrally and to direct axons at the midlines. By examining migration of a single axon in vivo, we show that nidogen is required for the axon to switch from circumferential to longitudinal migration. Specialized basement membranes may thus regulate nerve position. Amino acid sequence of mouse nidogen, a multidomain basement membrane protein with binding activity for laminin, collagen IV and cells. The whole amino acid sequence of nidogen was deduced from cDNA clones isolated from expression libraries and confirmed to approximately 50% by Edman degradation of peptides. The protein consists of some 1217 amino acid residues and a 28-residue signal peptide. The data support a previously proposed dumb-bell model of nidogen by demonstrating a large N-terminal globular domain (641 residues), five EGF-like repeats constituting the rod-like domain (248 residues) and a smaller C-terminal globule (328 residues). Two more EGF-like repeats interrupt the N-terminal and terminate the C-terminal sequences. Weak sequence homologies (25%) were detected between some regions of nidogen, the LDL receptor, thyroglobulin and the EGF precursor. Nidogen contains two consensus sequences for tyrosine sulfation and for asparagine beta-hydroxylation, two N-linked carbohydrate acceptor sites and, within one of the EGF-like repeats an Arg-Gly-Asp sequence. The latter was shown to be functional in cell attachment to nidogen. Binding sites for laminin and collagen IV are present on the C-terminal globule but not yet precisely localized. Human nidogen: complete amino acid sequence and structural domains deduced from cDNAs, and evidence for polymorphism of the gene. Nidogen, a multifunctional glycoprotein, is an integral part of all basement membranes. In this study, human nidogen cDNAs were isolated and characterized from human placental and skin fibroblast cDNA libraries by hybridization with a mouse nidogen cDNA probe. Six overlapping clones covering 4.9 kb were characterized. The composite cDNA contained a 3,741-nucleotide open reading frame which coded for a 1,247-amino-acid peptide that included a hydrophobic signal sequence. The deduced amino acid sequence contains seven epidermal growth factor-like cysteine-rich repeats, one possible tyrosine O-sulfation site, and a possible N-glycosylation site. The tripeptide sequence -Arg-Gly-Asp- (RGD), a potential cell attachment site, was also present. Human and mouse nidogen sequences were 84% homologous at the nucleotide level and 85% homologous at the deduced amino acid level. Southern blotting of human leukocyte DNA from 23 individuals indicated that nidogen probably is a single-copy gene and shows multiple restriction fragment length polymorphisms when cleaved with Eco RI, Pvu II, Taq I, and Msp I. In particular, digestions with Pvu II revealed polymorphism in four discrete DNA fragments, which could be discriminated by hybridizations with nidogen subclones. One of the polymorphisms revealed an allelic frequency of 0.52/0.48. Thus, human nidogen gene displays RFLPs which provide analytical tools to establish genetic linkage between the nidogen gene and a clinical phenotype. Amino acid sequence and domain structure of entactin. Homology with epidermal growth factor precursor and low density lipoprotein receptor. Entactin (nidogen), a 150-kD sulfated glycoprotein, is a major component of basement membranes and forms a highly stable noncovalent complex with laminin. The complete amino acid sequence of mouse entactin has been derived from sequencing of cDNA clones. The 5.9-kb cDNA contains a 3,735-bp open reading frame followed by a 3'-untranslated region of 2.2 kb. The open reading frame encodes a 1,245-residue polypeptide with an unglycosylated Mr of 136,500, a 28-residue signal peptide, two Asn-linked glycosylation sites, and two potential Ca2+-binding sites. Analysis of the deduced amino acid sequence predicts that the molecule consists of two globular domains of 70 and 36 kD separated by a cysteine-rich domain of 28 kD. The COOH-terminal globular domain shows homology to the EGF precursor and the low density lipoprotein receptor. Entactin contains six EGF-type cysteine-rich repeat units and one copy of a cysteine-repeat motif found in thyroglobulin. The Arg-Gly-Asp cell recognition sequence is present in one of the EGF-type repeats, and a synthetic peptide from the putative cell-binding site of entactin was found to promote the attachment of mouse mammary tumor cells.